Chrissie Diesel from Ruthin came to our In Work Support Service for help when she found she was struggling to adjust to the demands of life as a vet after graduating from Liverpool University. 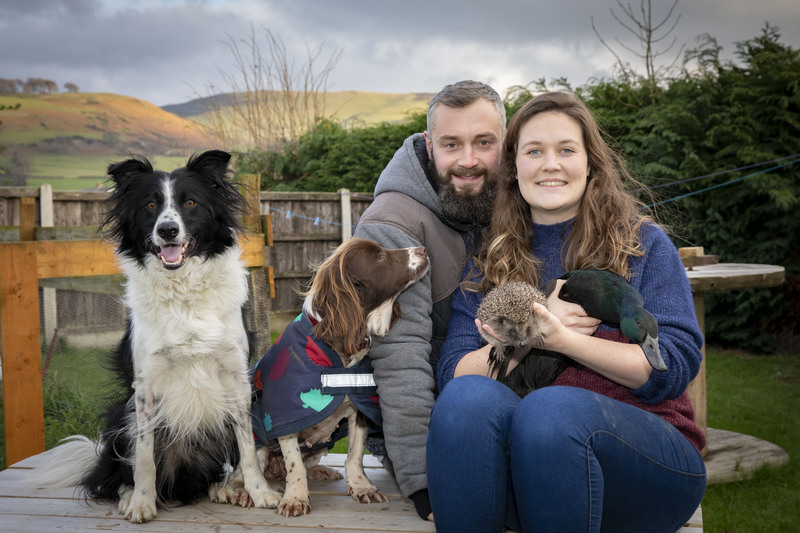 Feelings of anxiety appeared on her first day at the busy Wern veterinary practice in Ruthin, although she didn’t recognize what they were at time. Chrissie initially continued to work through her concerns and soon became a popular vet with clients and colleagues. But her nausea continued, and she started to get ‘nagging doubts’ about whether she was up to the job. Over time, Chrissie started to feel her resilience and confidence was being whittled away by her rising levels of anxiety. Chrissie eventually went to see her GP, who told her about RCS’s In Work Support Service. Working with her therapist, Chrissie was able to identify her anxieties and how she could deal with them. The difference the scheme has made to her working life, Chrissie says, is remarkable. “I would have never given up being a vet, but I think I would have become a very unhappy person if I hadn’t had some help. The twenty five-year-old and her fiancé Huw Bill have asked for donations to RCS instead of wedding gifts when they marry in July. She hopes that money raised for her wedding will enable more people to get the support they need to stay in work. Debbie Williams, Manager of the Bron Haul Residential Home in Rhyl, has attended a number of our Employer training workshops in order to learn techniques for managing stress, both for herself and her staff team. From the workshops, Debbie gained a range of practical tools and techniques for improving wellbeing in the workforce. She was able to introduce a series of wellbeing measures which have now been embedded into workplace practice at Bron Haul. These include ‘return to work interviews’, regular social events, and a ‘Carer of the Month’ award scheme. Staff are advised how to self-refer to the In Work Support Service if they need one-to-one support. Stephen Thomas had been working as a truck driver before an agonising condition left him unable to get out of bed and out of work for three months. Stephen registered with the In Work Support Service and was quickly referred for a physiotherapy assessment. Within a month of starting treatment, Stephen was back behind the wheel of his truck. Stephen said: “I started to get back pain at the end of January 2017 but being a man I just left it. I thought I’d be alright so put off seeing the doctor. “Then in June I knew enough was enough. I couldn’t work anymore and I felt sick from the pain. “I’d never been off from work in my life and my employers couldn’t believe it when I said I couldn’t come in. My employers were very understanding and I was paid my sick pay entitlement but I couldn’t walk, I couldn’t get out of bed, I couldn’t even bend over to put my socks on. “I was admitted to hospital and underwent lots of scans – these tests went on for weeks and weeks. “That’s when they recommended I speak to RCS. I had an interview and they said we can help you. Their therapist did six treatment sessions on my muscles and by September I was back in work. “I’ve changed the way I do a lot of things now including the way I lift things at work. I do different stretches at home as well as exercise at the weekend and making sure I have a long soak in the bath to help my muscles.